Sometimes I feel like Groove is lost in Wonderland, over the years Alice in Wonderland has served as inspiration for several different Alice in Wonderland series of dolls each with their own unique interpretation of the subject material. 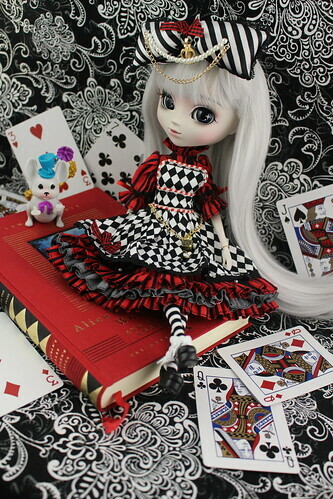 The latest Alice in Wonderland inspired series of dolls from Groove is the Optical Alice series which stands out because of it’s the almost ethereal pale skin color of the dolls contrasted by the bold color scheme of red, black and white for the doll’s outfits. I know some fans of Pullip may feel that Alice releases have reached the oversaturation point as there have just been so many over the years (complete list here) but the Alice Pullips have consistently been very popular and sell really well, personally I love Alice in Wonderland and as long as Groove continues to interpret the theme in new and different ways I’ll continue buying all of the Alice inspired dolls! 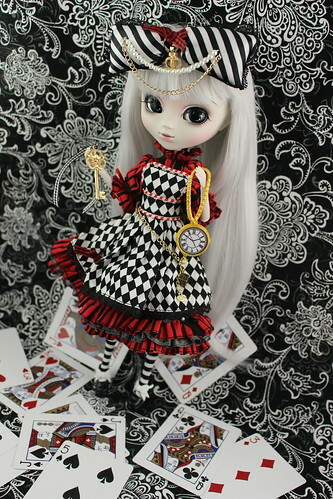 The Optical Alice series debuted earlier this year with the release of Pullip Optical Alice who was released in February of this year and had a MSRP of 18,000 yen. Although there have not been any official announcements of other dolls in the series Groove displayed prototypes of them at a recent doll event. 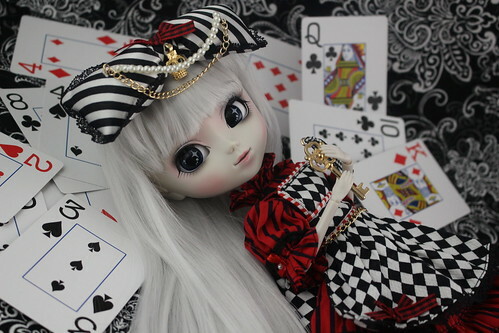 I can’t wait to hear more news about the forthcoming releases from the series including what appears to be a Pullip Red Queen, Isul White Rabbit, Dal Cheshire Cat and Taeyang Mad Hatter. 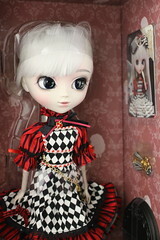 Pullip Optical Alice in the box. First impression upon seeing her in person was that wow, I had known that Groove had described her skintone as being pale but I was really surprised by her skintone and just how lovely it is in person! 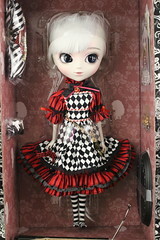 Pullip Optical Alice comes dressed in a dress, apron, belt and tights her shoes, hair bow, stand and card come attached to the box. 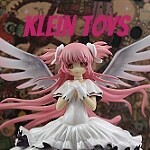 Overall I was very impressed with what I saw when I deboxed, the quality seemed very nice. How is the quality of the wig? The wig is a very pale grey in color, I think the color suits her really nicely. The quality of the wig overall is nice, it’s very soft and seems to be fairly thick (no thin spots on mine). Optical Alice has a fantastic face up! I was initially concerned that because her skin tone is so pale her features would kind of wash out especially in photos but thanks to some well done contouring and blushing the red tones of the blushing keep her from getting washed out. 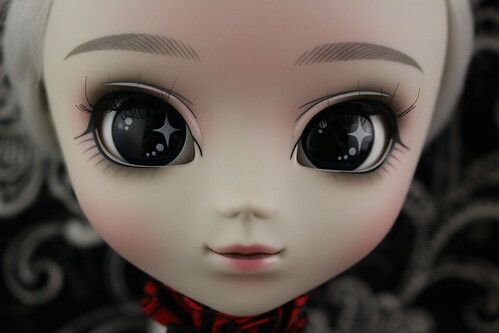 I can not praise the blushing enough, I love it and it’s just really well done and this style is something we don’t see used on Pullips very often. Her eye makeup is really nicely done too, the lashes are a bit stylized but the smokey eyeshadow is what really makes it stand out in contrast with the red blushing. Her eyechips are so dark in color that they are almost black, I love the bishoujo-style detailing on her eyes she looks starry eyed (this style is quite popular in girl’s comics). I like the way that her eyebrows are crosshatched in such a way to suggest fullness. Her lips are done in a really unusual but interesting way, they are painted and shaded darker in the middle and that makes the pale red of her lips pop that much more. The shape of her lips is altered a bit by the way they are painted, the sides of the lower lips are diminished a bit, it’s interesting all the different lip shapes that Groove has been able to achieve without actually changing the mold. 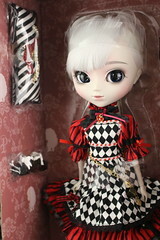 Pullip Optical Alice’s stock outfit consists of a dress, apron, hair bow, belt, tights, shoes and a key accessory. I like her stock outfit because it is the iconic outfit that I think of when I think of Alice with the classic dress and the apron but at the same time the unusual color and fabric choices elevate it to be something new and different. 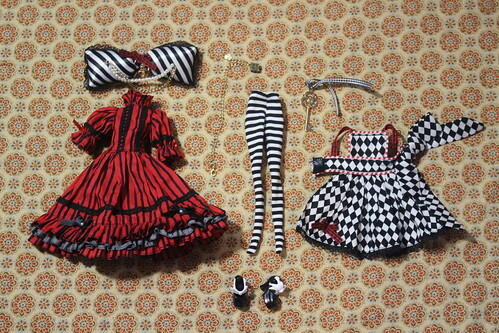 I love the contrast of the red and black striped dress with the black and white checkerboard pattern of the apron. The apron is punctuated with some red, I like that it pretty effectively hides the straps of the apron when it is worn over the dress. The tights are the classic black and white striped tights that have are often associated with Alice. The hair bow is accented with faux pearls, gold chain and a little crown charm, it’s a little different in design to what is normally seen with Groove dolls it’s not on a normal barrette or clip it’s more like a comb that locks into place. I love the little bit of a gold accent that the belt provides and the small dice and heart charms attached to it which can be seen in more detail here. Her shoes complement her outfit nicely. 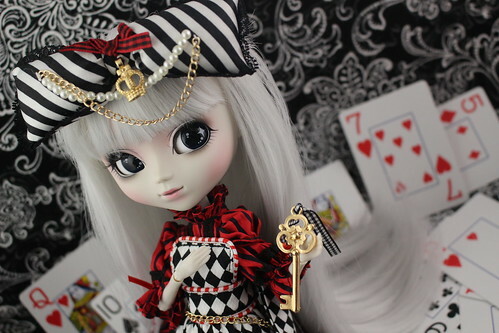 She comes with a gold colored key as an accessory, it has a black and white patterned ribbon attached. I mentioned previously that Optical Alice had a rather unique pale skin tone so I would be remiss if I did not include a comparison photo that better shows off just how pale she really is. She is pictured above with two other recent releases Creator’s Label Pullip Lupinus and Pullip Katrina, Lupinus is in the more normalized range for Pullip while Pullip Katrina has more of a tan skintone closed to the “tanned” MIO or Make It Own kits (though maybe with a bit more of an olive tone to it?). After Optical Alice was announced but before she was released I randomly decided to buy a newer collected version of Alice’s Adventures in Wonderland & Alice Through the Looking Glass as my copy was falling apart and the one I bought happened to be a good match for her color scheme. I decided to make good use of the book as a prop for some of my photos of Optical Alice as what better prop could there be for her than the book that inspired her existence? 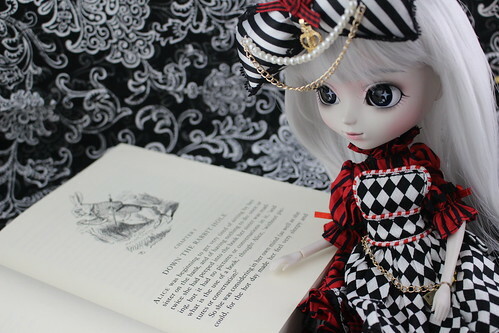 I don’t believe I’ve ever actually used a book as a doll photo prop before. Trying to incorporate the book into my photos of Alice was kind of an interesting experience but I feel like the photos of her with it worked out pretty nicely. It doesn’t get much more meta than Alice reading about her own adventures down the rabbit hole. I love that Optical Alice is both a nod to the classic Alice as well as a departure from it, I feel like Groove did an overall amazing job with her and am very happy that I was able to add her to my collection. I think that the Alice in Wonderland dolls have consistently been my favorite dolls to photograph and I’ve managed to acquire quite a few Wonderland-esque props and accessories a lot of them are borrowed from playline doll lines such as Ever After High while others like the colorful mushrooms were just something I happened to see in the store one day and thought oh hey they are very Alicey! 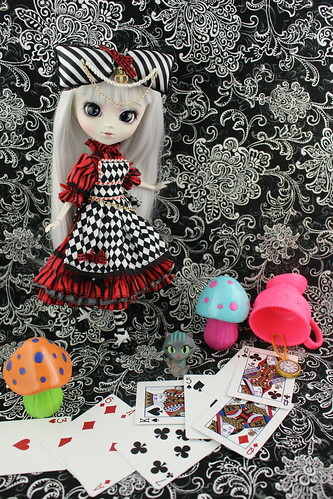 In addition to various Wonderland themed props that I have acquired over the years, Pullip Optical Alice even managed to make a new friend. Optical Alice’s companion is Grin an artist ball jointed doll made by Mushroom Peddler that I received as a birthday present many years ago now. 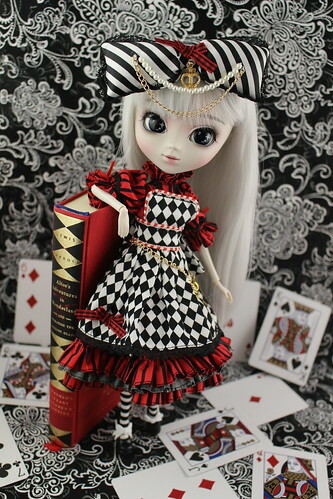 Of course, playing cards are always a classic accompaniment to any Alice doll. 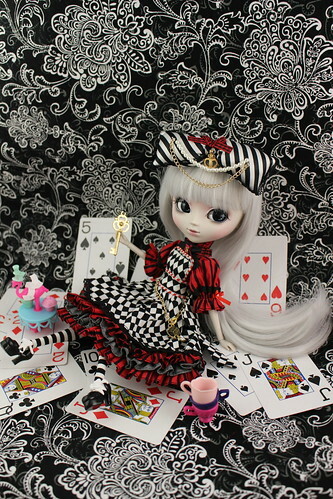 Especially in the case of Optical Alice, I really like and appreciate the way that the colors of her stock echo the different playing card suits. It’s time for tea! 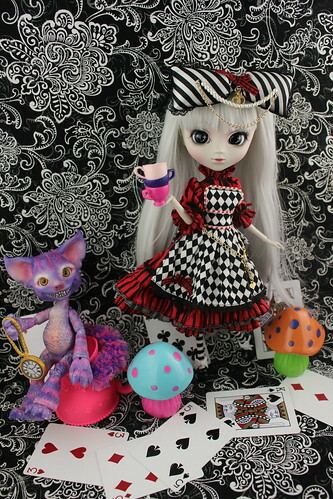 Optical Alice really seems to be enjoying the opportunity to have a tea party with her good friend Earl Grey (EAH Madeline Hatter’s pet). Such a lovely face, her beauty has an almost haunting quality to it! I’m going to play devil’s advocate for a moment, even if someone wasn’t a fan of the Alice in Wonderland theme, the dress hiding underneath the apron is lovely with a bit of a gothic vibe to it. The dress when worn alone reminds me of something that Mrs. Lovett from Sweeney Todd: The Demon Barber of Fleet Street would wear. If you accessorized the outfit with a black hat and switched the tights out for black tights either opaque or lacy she would be gothic perfection! 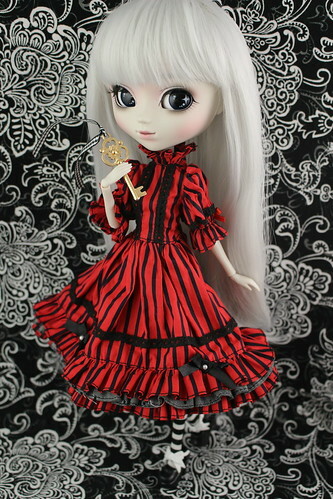 I feel like she does have potential outside of just being another Alice doll. 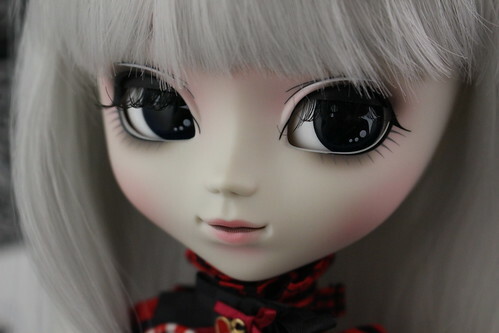 More photos of the wonderful Pullip Optical Alice can be seen on my flickr. 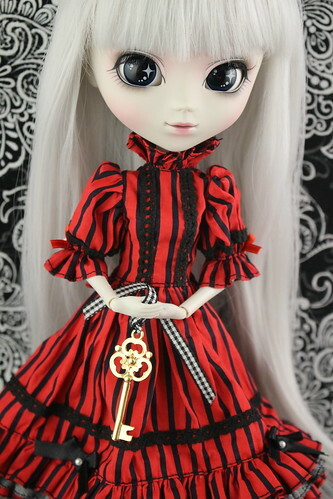 I can’t wait for the other dolls in the Optical Alice series to be released, if they are anywhere near as nice as Optical Alice herself I know that they will all be fantastic releases. 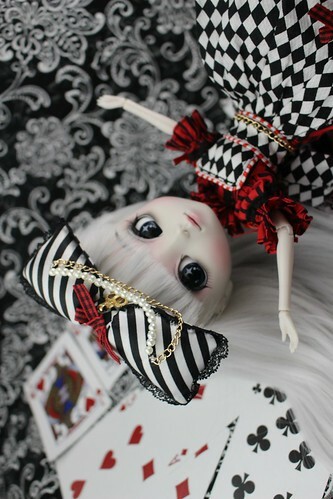 I hope that you have enjoyed this write up of Pullip Optical Alice, I hope to have some other doll write-ups posted up here soon. 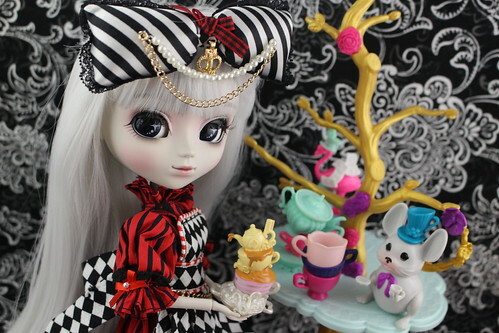 This entry was posted in Doll, Pullip and tagged 2017 groove, 2017 pullip, alice in wonderland, asian fashion doll, fashion doll, groove, optical alice, optical alice pullip, Pullip, Pullip Katrina, pullip lupinus, pullip skintone comparison, skintone comparison. Bookmark the permalink.